Earlier this month, I shared a new financial framework I've been developing, one that stresses earning, spending, and saving as the building blocks of personal finance. Last week, I elaborated by sharing how I make money. This week, I'm turning to the other half of the basic personal-finance equation: spending. Or, more precisely, the lack of it. Instead of talking about theoretical ways to cut costs, I'm going to share the things that Kris and I do (or have done) in our own lives to put frugality and thrift into practice. Though I could (and will) list some of the individual tactics I've used to reduce spending, they're less important than the broader strategies I've implemented. These strategies are the guiding principles that frame the way I look at spending. From them, I'm able to develop specific habits to help me pinch my pennies. I avoid recurring costs. A few years ago, I had subscriptions to three newspapers, a couple of on-line computer games, and a dozen magazines. I had a monthly phone bill, a cable bill, and a bill for the internet. I had hundreds of dollars in recurring costs each month. Gradually, I've cut these costs to the essentials. I've ditched the home phone and the cable television. I've canceled the computer games and most of the periodicals. I've learned to avoid subscription fees whenever possible. I try to be patient. It used to be that when I wanted something, I wanted it now. I'm still like this, really, but I've learned the power of patience. I use the 30-day rule to make sure I'm not buying on impulse. And if I really want something, I consider practicing predatory shopping — waiting for the bargains and extreme markdowns so I can save big bucks. These are just five of the broader concepts I use to guide the way I spend. In turn, these broad strategies lead to individual tactics I use to practice frugality and thrift. And what are those tactics? Let's look at a few. We share with friends and neighbors. The real millionaire next door and I have a pretty good system going. I use his pruning ladder; he uses my greenhouse plastic. He fixes our flagpole; Kris bakes him cookies. He mows our lawn in spring; I mow his lawn in summer. And so on. But I do this sort of thing with other friends, too. By sharing tools and resources, only one of us has to own any particular item. When possible, I buy used. Not everything is available used. And sometimes I'm not patient enough to wait for what I want. But there are plenty of times that I'm able to find books and CDs and DVDs and clothes and furniture for cheap, either at the local thrift store or on Craigslist. For example, some of my best yard tools were bought for just a buck or two at estate sales. We garden project, you know that Kris and I have berry plants, fruit trees, herbs, and a vegetable garden. You also know that Kris makes prize-winning pickles and preserves. We don't save a lot of money this way — but we do save some. Since we (especially Kris) enjoy this activity, it's also a hobby that gives us back something for our time and efforts. We use a clothesline — when the weather co-operates. Kris rigged up an improvised clothesline one summer. Then we found a carousel line at an estate sale. (Which I carried home, walking two miles.) When it's warm, this saves us a few bucks per month on electricity. Plus it prolongs the lives of our clothes. We're gradually learning more about DIY home maintenance. I'm not afraid to call in an expert, but I'm also learning that there are some projects we can do ourselves. I have a feeling this summer will be full of them, actually. It's been a while since we focused on home maintenance. We cut services we don't use. It can be tempting to keep your landline or cable TV, even though you don't use them much. But I found that one of the best ways to improve my cash flow was to kill these services. I've never missed them. Note: I want to stress that we don't cut costs on everything. We're frugal, yes, but we're frugal with a purpose. We use these tactics to curb our spending on the things that aren't important so that we can spend on the things that do matter to us. For the past two years, of course, that's meant travel. But for me, it also means my gym. And my Mini. And my Portland Timbers tickets. And we support our city's many excellent restaurants by splurging on excellent dining. I choose to spend less on some things so that I'm able to spend more on others. By using these strategies and tactics, I've reduced my monthly operational expenses significantly, freeing money to be put into savings or used for other priorities. But I'm far from perfect. I still spend money on things that I shouldn't, and I still make mistakes. I recently subscribed to The Economist, for instance. I love the magazine, and in theory, a subscription is a fine idea. Reality is different. I paid something like $120 for 52 weekly issues. That's a lot of money, and it hurt to write the check. It hurts even more to see that I'm not reading the issues as they arrive. They stack up next to my recliner. Once per month, I spent maybe ten minutes flipping through the stack before sticking the pile in the recycling bin. It's like recycling money. I'd be better off buying the occasional issue on the newsstand. So, as I say, there are lots of little areas left for me to improve on. And that's fine. I've made a lot of progress, and I'm willing to be patient as I continue to master the art of spending. There are 118 reader responses to "How I Spend My Money". One of the tactics I like to use is to stick something on my amazon wishlist when I want it. Usually it will stay there until Christmas or my birthday when someone will buy it for me. Often I’ll hit the library, check out a book on the list (if they have it), and decide I do or don’t really want my own copy. That’s exactly what I’ve been doing as of late, Nicole. I’ve noticed that lots of items will stay out there for quite some time, many of which I’ve forgotten about! Right before gift giving holidays I’ll cull to see if I really want the things I put on there. I went through some of the phases you mention! Started with recurring costs – moved to prepaid, got free landline, cut cable. The savings add up! Home maintenance is expensive if I have to call in the experts as I’m learning! I need to get a handle on that. I’m actually against bulk purchase – I canceled my Costco membership. I end up with waay more stuff than I need. But very nice tips GD! Any tips to prevent birds from pooping on them? I’ve tried line-drying on multiple occasions, only to need to re-wash several items because birds used them for target-practice. A couple big-ticket items like sheets were left pretty unsalvageable because of (berry? acid?) staining. That is weird! I’ve been a (weather-cooperating) line-dryer all my life I don’t know that that has ever happened. Since you’re in hot texas though, why not hang them out under your patio roof or some other shade? keeping them out of direct sunlight will save the colors from fading too. Sadly, our best shade is under trees–which means a graven invitation to the birds to camp out over the laundry. Though it might be worth trying to hang clothes in the garage (instead of storing junk like most folks on our block, we actually use both bays of our garage for :gasp: parking cars, so when one of us is out at work, there’s a car-sized space in which clothes could be dried). Thanks for the suggestion. That was going to be my suggestion too – mine is on the screen porch. To not occupy all the space, we installed it above head height. It’s on two pulleys, so I stand on a footstool to hang stuff up, but the line moves so I don’t have to get up and down over and over. Don’t people have basements in the US? It’s common in Europe to just put up a line in there, put up the clothes and go get them a few days later. Works great, and you don’t have to worry about weather! I’ve also seen people use the room underneath the roof. Growing up in the north-eastern US, our family and most of our neighbors had a basement. Down here in TX, I can’t say I’ve seen a single house with a basement. Unfortunately, the garage is the only semi-outdoor space in which the drying would be remotely convenient. But I plan to give it a try. Nah. I also live in the (wet) Portland OR metro area. We have a basement, and I hang up many items to dry (mostly to keep from setting any stains I may have missed the first time around, since husband works in industry with oils and such around). They don’t mildew unless you leave them too long in the washer before hanging them up! Not where there isn’t a high water table. My laundry room is pretty big and has quite a bit of space to hang stuff up, so that’s where I hang dry all of my shirts. Is there a room inside your place like that? I do the same think Kris does…any catalogs that come to us get recycled as I walk into the house with the mail. I literally don’t even look at them to see what company they came from. Quick tip on the Economist, JD….if you travel a lot/some, you probably get airline miles. With American Airlines miles program (and probably others as well) you can actually use your airline miles to subscribe to magazines,including the Economist. That’s how I, at least, got a free year of the Economist…..pretty easy way to save $120, if you ask me. Specifically for the Economist – you can get all their articles in digital format by subscribing to a (free) newsletter or RSS feed. I used to have 1.5 hours/day on metro and actually read each Economist issue cover to cover – now that I don’t have that commute, I just get the RSS feed. If you really must have the paper copy (myself, I like to actually hold my reading material), the Economist goes on sale every now and then through sites like DiscountMags. You can set up a deal alert at Slickdeals.net and it will send you an e-mail anytime someone in the community posts a deal that matches the keywords you input. Hate to do this to you J.D. I love The Economist as well, but since I already subscribe to Businessweek I passed up on the deal Groupon had on 4/21/2011: $51 for 51 weeks of The Economist. Looking up-blog, I see that you have a good number of United miles. You can get an Economist (among others) subscription for a few thousand. I have a really similar mindset, with different priorities. But used the same route to get there. A gym membership, going out to eat, and fancy car are not important to me. Going to the theater, taking short day trips and certain subscriptions are. I have cut down in many of the same areas, though. I’ve assessed which subscriptions I care about, and cancelled the rest (the keepers are my local paper daily, the Sunday NYTimes, and the weekly New Yorker). I got rid of my tv and just listen to public radio. I try to get everything free or second-hand and grow what food I can (in pots, in my downtown patio). I second the idea of limiting exposure to advertising. With no tv, public radio, and no mall time, I really know what consumer goods I actually need, and don’t get tempted by those wily advertisers. Several years ago, I was asked to contribute a money-saving tip to a booklet that was being published for a ladies’ group. Mine was “Don’t go shopping.” My advice wasn’t well received, but honestly, the best way to save money is to not tempt yourself into spending it. This would include staying out of the mall, discarding catalogs, not watching commercials, staying away from internet stores when online and blocking ads. It’s amazing how much stuff you didn’t realize you needed until you saw it, so I try to keep myself from seeing it in the first place. I HATE montly bills! That alone is reason enough for me to not get cable. I just watch my favorite shows online instead. I do, however, have a cheap gym membership ($12.99/month) because I simply don’t have the drive or discipline to work out at home and I don’t want to wait until I have 50 extra pounds to find that drive! Hopefully someday I will get fed up enough with paying that bill that I’ll find my inner drill sergeant. Oops… I meant to make my own comment not a reply! I agree with you Marsha….walking through the mall just makes you want to spend money. Now I do not even go in stores unless I have something definite to buy. The only shop I will look around in is the book shop….a look at what is new and if I really want something I will write the title down and order it from the library . A lot of great points here, but in some regards you need to enjoy yourself too. As for A/C and heat… I keep the A/C cranked in the summer, and the heat is usually around 70 in the winter… i want to be comfortable. Again, after a long day that is important to me. 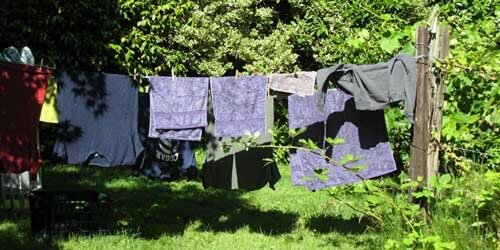 My parents use a clothesline, and did with my clothes growing up. I use a gas dryer now. The sun doesnt fade my clothes now, and the fabric is softer, it’s just more comfortable. I like what you said about not purchasing extended warranties. Best Buy is popular for this, and it’s typically on items that will be obsolete long before they break. Another reason NOT to purchase extended warranties on electronics is that, not only you’re entitled to a nice 12 month period by default, but most credit cards (at least Mastercard and Visa) automatically extend that to 2 years if you use the card to purchase them. Not many people know this, and it’s a bit of a hassle (you have to pay for replacement/repairs, then claim the expense), but it’s definitely better than the overpriced, just-in-case warranties they push through you at the checkout counter. With the Economist: Ever asked your library? My definition of conscious spending is a little broader than yours. I include spending in ways that supports my values. For example, I hate the idea of saving money by buying stuff made by people who aren’t being paid a decent wage or being treated fairly on their jobs. I want to reward companies that are doing the right thing. So I buy most things used, to avoid supporting companies that use sweatshop labor. Clothing and shoe manufacturers are especially guilty of this. Sometimes I can’t buy things at all because I can’t find a product not made in China (which has the side effect of saving me money when I go without). Other times I have to spend more. For instance, I’m not quite ready to buy used underwear so we spring for organic products made in the U.S. or Canada. Overall, I find that keeping my values in mind when I shop focuses my attention to be more conscious in the way you, J.D. are talking about it. My values might not be important to others but most people value something in this world. I wonder what our economy would be like if everyone shopped with their values in mind? People concerned about children would ask about the impact of their purchase on kids. Families who don’t want to support the production of cigarettes might reconsider buying from big food companies that also make tobacco products. Folks who love animals would ask if their purchases are sustaining animal testing. I bet spending overall would go way down. And we might even see some more conscious choices by the companies who produce all the stuff we buy. This comment is very interesting as clothes are important to me. I also would not like to support oppressive labor conditions. But I have not the faintest idea whose factories are oppressive. I’m not at all certain that avoiding everything made in China is the correct way. Seriously, how do we know what sources outside of the U.S. are providing opportunities or simply exploiting the local populace? Also, my understanding is there are still sweatshops in the large cities of the U.S. who exploit recent immigrants. This is certainly food for thought. E. Murphy you are so right. we are intentionally kept in the dark on these issues. I love clothes too but try to buy US, Canada, used, etc. when I can. Check out Green America thogh they have a good shopping guide with lot of info on material sources. Place of origin isn’t important for me, though I know it is for a lot of people. When I buy stuff at a thrift store, it’s sometimes tough to know where it’s made. But then it’s tough to know where the “middle-quality” stuff is made, too. But I’ve found that, for the most part, when I buy quality clothes (and other items), the manufacturers almost always say where the stuff is made — usually because it’s not China. I’m not sure this is true for all high-end places, but it is for the ones I’ve been using. You are all right that it takes a lot of research to nail down everything. I short cut things a bit. I know that countries in the EU, the US and Canada have labor laws. They’re not always perfect and people fall between the cracks. But it meets at least a minimum standard. Labor laws as we know them don’t exist in many other countries unless people there choose to meet higher standards such as fair trade. So I only buy items made in countries with labor laws or that are certified as fair trade. I don’t worry about where things are being made when I buy them used because the money is already spent. Buying something second hand does not increase the profits of companies exploiting labor. I’ll just reiterate that we all have values that are important to us and adding them into the mix when we make spending decisions is another way to be more conscious. JD! Did you watch my video? Amazon is almost always cheaper than iTunes for TV shows. Unless you have an Apple TV or you watch the shows on an iPad or something, you may want to consider switching to Amazon for your individual show purchases. You seem to be saying that you take hot baths because you are cold in your home. Have you calculated whether it would cheaper to just raise the house temp a few degrees? It’s my understanding that hot water use is one of the biggest energy hogs around. Totally agree on line drying for the clothes – especially cottons, which seem to really get messed up in the dryer. I might dry the clothes with a dryer sheet (which I cut in half) for 10 minutes to get them soft, but then they go on a drying rack. On a nice day I can put them outside, but I don’t have a permanent line – the rack works fine. This greatly prolongs the life of jeans, t-shirts, cotton shorts and other materials – but it mostly helps the frequently worn, cheaper clothes last longer. Women’s undergarments never hit the dryer – that’s the best way to ruin them. Wash in delicate cold cycle and then line dry. I’ve been trying the opposite – line drying and then when they’re all stiff and crackly putting them in the dryer with a sheet on tumble. That also gets out some of the funk outdoor smell and dust that gets in them. Seems to work ok and keeps the wrinkles down. That’s the order I do it in, too. Air dry, then pop it in the dryer for a bit. You don’t have to pay that much for The Economist. They actually have a plan with a price of 12 issues for $12, and it auto-renews indefinitely. I save a ton of money off the cover price. Did you know that the Economist halted production so people can catch up on reading it? Funny! I had that same link to post, and then saw you’d already done it. I read the Economist from back to front, becasue the fun stuff in the back is more interesting to me. We get our subscription with airline miles, too, as another poster suggested. “ESPN The Magazine announced Monday it would be suspending publication indefinitely until its readers learned to read.” LOL. The Onion’s always good for a laugh. 58 degrees? I would die. Do you turn up the thermostat for guests? I know I didn’t like visiting my father in law because he kept his house at a chilly (to me) 65 degrees. However, I am one of those people that is cold all the time. Therefore, I am willing to spend on heating. I feel the same way regarding subscriptions. I find magazines almost like a chore sometimes. I see the pile stacking up and feel like I have to do something about it. I have not renewed any magazine subscriptions in the last year except to Discover, which I always read. It’s only 58 during the day when we’re not around. (Or if I’m home by myself.) It kicks up (to 65, I think — it’s Kris’ bailiwick) in the evening. I will trade weather. And gladly. 58 sounds delightful. We had 4 inches of snow yesterday. So what was your problem again? My thoughts exactly Gayle!! Next week, the highs in my part of Michigan are supposed to be all the way in the mid 50s, and accompanied by rain. JD – I feel your pain. I live near Cincinnati and we are having a miserable spring. Rain and in the 50’s almost every day. I haven’t even been to a Reds game yet because I refuse to be cold at a baseball game. I am careful with how I spend my money for the family and practice many of these things as well. What I find interesting is the response I get from my coworkers when they see me turn down take out or drive an old paid for car. I was told that if my car had 100K on it I shoud get a new one, >200K miles is unacceptable (from a physician). It is tempting to blow the budget at times with these outside influences though. I can especially relate to “limiting exposure to advertising”. My children are noticably more needy and demanding after watching commercial television for a couple of hours. Switching to PBS saves us money as the kids are not as aware of the plastic junk, and sugary slime. It makes for easier shopping trips to the grocery store as they are not scrambling to put the bad stuff in the cart. I suppose this is one justification for TEVO, as it allows the ads to be zapped away. It also shows how closely the marketing machine has focused on young minds…they are very effective. Living in Texas makes no A/C in the Summer a no-go for me. But I have no problem cranking down the heater in the “winter” down here – its the wife that tends to veto that decision! I like your notion of either buying cheap or going all out. I hate buying junk, and I try to save up for a quality item as opposed to buying something that just won’t last. My s.o. doesn’t always understand what I do, but we both benefit from this habit of mine. My father was the same way. Subscriptions and recurring costs add up really quick. That’s why they’re so dangerous. You might think 5 bucks here, 15 bucks there is not big deal, until you’ve got 5-10 subscriptions going and they’re taking out 150 bucks a month. I also advocate not going to the movie theater often. Get Netflix, or just be patient and watch the movie later. It’s not like the movie is going to change in the next couple months. Sometimes you can get a great deal though on groupon or another coupon site, so that makes it worth it. As for warranties on laptops, I am not so sure they are worth it anymore. If you find good deals on laptops (slickdeals), they’ll be ~500-600 for a very good one, and I just can’t justify spending 100 or more for a warranty when that adds 15-20% to the price. You and I approach things in similar ways. I think about what I spend (and make the wife do the same) and more importantly, what pot of cash it comes out of. The later is the critical thing. She used to think I was being “difficult” by making her think about spending as little as $5. On the face of it, it does sound cheap, but I budget *everything. * Not down to the penny — I do have an “everything else” fund — but those little purchases add up and can’t be ignored. That’s the important thing. I avoid recurring subscriptions. I do one magazine (which I think about dumping) NetFlix, cell phone, but no cable. Speaking of cell phone, we have a $93/mo family plan (including a texting plan and all taxes). It’s 450 daytime minutes, unlimited nights and weekends, and unlimited calling to 5 numbers for each person. We have no landline. Is there a better plan for us? My wife and I talk to family a lot and text a bit, so a strict prepaid plan is out. I’d need to supplement it with a landline if we did that. Try going over to billshrink.com. You put in your phone number, they pull your recent usage, then they tell you whether there’s a better plan out there. The site makes money from these suggestsions, of course, but it’s a good place to start. I found out that we already have a pretty darn good plan for our usage, for example. Yeah, BillShrink is a great place to check. I keep meaning to write about them, but haven’t made time. Plus, you might look at pre-paid plans. I second the looking at prepaid plans. Most carriers now have monthly prepaid plans that are comparable to postpaid plans, depending on your usage. For example, T-Mobile has a 1500 Talk & Text plan that costs $30 per month and gives you a combination of 1500 anytime minutes and text messages – the 1500 can be used for minutes or text messages, which is quite flexible. Are you using the max # of phone lines for the family plan? We share our family plan with another couple – we pay $60/mo for the family plan plus $10/each for 3 more lines, so it’s $25/person. We all went together to the Verizon store to get our phones set up, and all our names are on the bill, so I assume they’re OK with this usage of the plan. The “avoid the middle” idea is food for thought. I think it’s a great approach to things like your example of clothing. Cookware is another example that comes to mind. I think it can be dangerous for people who are just starting to get out of debt or get over a shopping addiction, though (some might see it as a license to buy the most expensive clothing, cookware, etc., when they really need to be making big cuts in spending). And, sometimes the middle is the sweet spot. I don’t need the most expensive toilet paper, but I don’t want the cheapest, either. ;) And I don’t want to fly a budget airline from an airport two cities away, but I also don’t need to fly first class. You’re right; sometimes the middle is the sweet spot. If you can get quality department store clothing on sale, for instance, you land in the middle. A good store brand might not quite be the cheapest, but you’ll save some money, putting you in the middle. Once in awhile though, you do need to buy the best. I bought leather boots that I wear often and that absolutely were worth breaking my budget to buy because they have held up and been so practical! 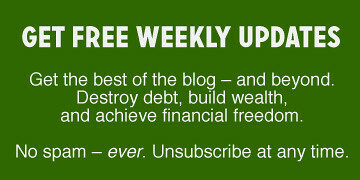 I agree that advertising is a powerful negative drain on financial independence. My first “real” job was for A.C. Nielsen. Most have probably heard of the Nielsen ratings (for tv ratings), but the company also does tons of market analysis on in-store advertising. The power of simple strategies to get people to buy stuff was appalling to me. The metrics are interesting though. Each product would have it’s own elasticity of demand for shelf space, etc. Most of the strategies are well known (products at eye level sell more, products with more shelf space would sell more). Some of the behind the scenes metrics are less well known like crowding out other products even though it wouldn’t necessarily increase sales, but rather decrease sales of competitors. It is interesting to me how beholden grocery stores are to the companies that provide the goods. Anyways, that experience in manipulation made me want to leave the company and has since made me detest marketing manipulation. One of my classmates works out of their Cincinnati office. In Cincinnati, there are *so* many cpg marketing analyst jobs for companies supporting Proctor and Gamble, Nielsen, etc. But, I’m the opposite of you. Although my classmates and I were educated with a quantitative mindset, I find the intersection of math with consumer psychology very fascinating. This includes shopping and banking/lending. I agree that those aspects of consumer phychology are interesting, and I don’t blame the manufacturers for wanting to sell their products. What was appalling was how easily consumers could be manipulated. I guess because I live frugally, I don’t like seeing people manipulated into buying things they can’t afford. I don’t think I should dictate to people what they can afford, but it also was not something I wanted to support. It wasn’t something that got me excited to go to work. I second the mention of checking your local library for a copy (copies) of The Economist or whatever magazine you may want to or already subscribe to. My local public library stocks The Economist. Yours might too. You mentioned your sharing with your “millionaire next door”. I think the concept of “sharing with your neighbors” deserves a posting or two. Talking with my barber the other day, he lamented that he sees very little sharing amongst neighbors these days. To illustrate the point, he mentioned that when someone needs an egg for baking these days, they are more likely to hop in their car and drive 20 minutes to the nearest Wal-mart instead of knocking on their neighbor’s door and asking if they could spare an egg. I think that’s a great example. It’s way more frugal to have neighbors you can share stuff with, but it might mean swallowing your pride. I actually wrote about our informal neighborhood exchange back in 2006. I should write about it again. I like it. It not only saves money, but also builds social capital. And you know I love social capital! I think that the turning point of having ‘neighbors’ instead of ‘people who live next door’ is when you reach the point that you can ask for an egg, or a cup of sugar. Despite living in suburbia – we have that and I love it about our neighborhood. One other question… do you *really* find it cheaper to cook from scratch than to buy the prepackaged stuff? I read many places that cooking healthy is more expensive than the prepackaged stuff — and I’m not referring to organic or truly high end stuff either — just run of the mill normal stuff. I cook a lot at home, and our grocery bill isn’t cheap — about $400 for two each month. I could save a lot of money if I picked up a frozen pizza every night. We eat healthier and we eat better, but I can’t say we eat cheaper. BTW, do you have any thoughts on an AeroGarden? We live in an apartment, so a garden is out, but I’m wondering if it truly saves money on herbs. We actually waste a lot, so I’m inclined to get it. AeroGarden gobbles electricity. Our electric bill went down after DH finally decided to stop using one he got for Christmas. Do you know by how much? For you to notice it, I guess it would have to be substantial — at least $0.50 per day. I’m trying to get a good feel for the true financials of the thing — it costs $100 to get, seed kits are $15, but $0.50/day in electric costs is nothing to ignore. I figure I spend $15-$20 on herbs each month but waste some of it. If your apartment has a window, you can still plant basil. It thrives on the windowsill so long as you remember to water it. We also had success with dill back when we were apartment dwellers. some herbs can be frozen so you are not wasting them. Freeze in ice cubes of water….then throw a cube into your cooking. Or they can be dried. You can’t omit the future costs to your health when quantifying your food expenses. This month it might be cheaper to eat frozen pizzas, but when you have to go to the doc b/c of HBP, diabetes, etc., see a dietitian, pay a trainer, etc. those savings are out the window. The cheaper the processed food the worse it is for your health. The companies want to make money, the’yre not giving you any nutrition in a $2 Totino’s pizza. Not familiar with the AeroGarden but herbs are cheap. A big bunch of cilantro or parsley is maybe 1$. You can freeze unused herbs or dry them and put them in a shaker. Fresh basil and mint are nice but take up too much space. The potential savings per space and effort aren’t worth it IMO. Yeah, you do have a point on health costs. I’m not going to stop cooking — I enjoy it, and it tastes too darn good. I think you might live in California or something like that, because where I live, “a big bunch” is over $2 at the major grocery stores. The commercial packaged stuff is $1.69 for the little plastic container. Thanks for the tip on freezing. I’m going to try it. Live in NOLA. I’ll often go to the smaller Hispanic groceries, generally cheaper fruits and veggies, esp. avocados. They’re not the bright shiny waxed up ones at the big chains that look all pretty, but they taste just as good. We probably have a pasta based meal twice a week, which is truly cheap — even if we make a clam sauce from canned (on sale) clams. Red sauce, olive oil and garlic, carbonara, all cheap and easy. Mac and cheese is probably my most expensive pasta dish — because I like to make it with a mix of nice cheeses. Eggs are a cheap meal too — fried egg sandwich, frittata or omelette, quiche, fried rice. Chicken, bought in the family packs or Costco in bulk works for another cheap meal. We buy frozen veggies and stock up when they’re on sale. In the summer we’re part of a CSA and get % off for letting our porch be used as a drop-off. That’s a double win! We eat salads in the summer and are more likely to have fruit salads in the winter with cheaper fruits. We buy fish at Trader Joe’s — packages are small enough that there isn’t waste from having too much for one meal too little for two in one package. I also shop at our local food co-op for spices, rice, beans, quinoa, honey, vanilla, liquid soap. You can buy just what you need and usually for less than the grocery even if you’re buying organic. But I admit…I love to eat out. LOVE it. Am working on that little problem! This is a complicated question, Dan. Looking only at costs, pre-packaged will always be cheaper. And if you’re hard-pressed, I think it’s fine to have a diet of processed foods until you can afford better. But, processed foods are demonstrably bad for your health. When I say we can make our own food more cheaply, I mean for the quality. So, for example, when we make bread, a loaf of similar quality would be more expensive. You could probably find cheaper loaves, but they wouldn’t be as healthy (or as tasty). Does that make sense? It’s a balance between health and costs and taste. Not necessarily! Cooking when you’re really broke. Do you have any actual, objective, medically-substantiated by good,well-designed, peer-reviewed medical studies that don’t rely on the people “recalling” what they eat that processed foods are “demonstrably bad for your health?” (Hint: Dr. House has it right: people lie!) I have never seen any such, and there are a lot of loose dietary statements being made that are not supported in the medical literature. LOL! C’mon, SLCCOM, all you have to do is READ THE HEALTH INFO ON THE PACKAGE. Lots of cholestoral and sodium = unhealthy. That is hardly an objective study. There is no evidence in the medical literature that cholesterol and sodium are “unhealthy.” Try actually researching the matter. Talk to a real scientist who knows how to design a study. People with low cholesterol die sooner, for example. Or, go on. Believe what “everybody knows.” Just don’t feel high and mighty because you “eat healthy.” You don’t. Dan – Try this Herb Keeper from Amazon if you cook a lot with fresh herbs but can’t grow them at home. It seriously helps keep them way longer. I take my read (or unread) magazines to the local used book store whenever the pile gets large enough. Getting a few dollars for them makes me feel better than tossing them into the recycle bin. J.D., you can send me your Economist mags! I love that magazine, but gave it up when we cut all our subscriptions. I love your notion about avoiding the middle in shopping. I try to do that too, but I hadn’t really articulated it as a practice. The way you laid it out makes so much sense!nearly everything I buy I get used, but I still make distinctions between things I need to spend more on to get high quality, like my computer, and things I can accept less from, like my thrift-store jeans. Have you considered cancelling your Economist subscription and getting a partial refund? At one point, I had too many magazine subscriptions, and I cancelled most of them. I would have been happy just to NOT get the magazines any more, but all of the publishers gave me a refund. I’ve put this on my list of things to do. I’ll give it a shot. I watch plenty of TV, but I instinctively either mute commercials or deconstruct them to strip away all the bells and whistles and get down to the point of what they’re trying to say. Usually I get pissed off and end up riffing on it for a few minutes much to my fiancee’s delight or annoyance, depending on how funny I am. I know that there’s no such thing as bad publicity and all that, and I’m still carrying on their brand in some way when all is said and done, but I find that this interactive approach to commercials tends to pull some of its persuasive power away. I use the library. This cut my book purchases from well over $100 a month to less than $25 on average. Sometimes I decide that I want a book that I’ve checked out of the library. Those and professional/technical books not available in the library I buy from ABE Books online. Magazines are also available in the library. You may have to go to the main library for more specialized titles but doing so not only saves money but supports a vital public resource. My librarian loves me because I “keep the numbers up” by reserving books online and having them delivered to my small local branch. I too turn the heat down in the winter but 58 is a bit extreme for me. We keep our house at 65. Great tip on “self-insuring”. Pay the minor things out of pocket and save the insurance for major claims. This will be one of my favorite posts! DH and I are trying to subscribe to these habits. While we do alot of the items on the list, we are not consistent. Consistency is key in order to reap the savings of not spending. Often I have overspent or go on a spending spree after a few months of not spending. Essentially the net gain there is 0 or even negative because I have deprived myself during those months of minimal spending. I have also learned to stay away from blogs and forums that promote consumerism: fashion blogs, celebrity oriented blogs, reviews of products, luxury blogs or forums, websites that promote fleeting or limited time sales, invitation only online shopping, etc. I have caught myself numerous times ‘lemming’ for items I really don’t need. Lastly it is important to detach emotions from STUFF. Stuff is not what life is about. Thank you for the great reminder. Along the lines of high deductible insurance, would a health savings account (HSA) work well in your situation? Good to see you excited about finances again. More articles relating to you would go a long way to revitalize you, I think. Enjoy the weather — it should be nice today, tomorrow, and Saturday. I’m a big user of my local public library system here in Milwaukee. With my library card I have access to not just all the libraries in the city, but all of the surrounding inner-ring suburbs, meaning that I have the collections of about two dozen libraries at my disposal. With a convenient online system for finding and requesting materials, just about anything can be had quite easily if you’re willing to wait a few days for it to come in. I haven’t visited a video store or used Netflix in quite some time, because most of the movies I would ever want to watch are available for free. About a year or two ago I went through and eliminated or reduced as many recurring charges as I could – that helped a lot. I also avoid advertising and shopping malls – no network television, only TV5 French satellite TV which has no advertisements at all. It costs me $12.95 a month but is totally worth it. Same with Sirius satellite radio. That is basically my only entertainment, for $24 a month, I think it’s cheap. I use internet at work and don’t have a landline, use only prepaid cell phone. This year my goal is to not turn my thermostat up over 65, ever. Will see how it goes! I absolutely agree with eliminating the insidious financial drag of recurring monthly payments. They are counting on you not paying attention to how they add up. Another important thing to avoid: magazine subscriptions that “auto-renew” every year. Auto-renew eliminates your chance to reflect if you really want another year of a magazine before you pay for it again. Many magazines these days are being sold to different publishers, and over the course of a year the content can deteriorate or change rapidly in which case you won’t want to renew. Try putting your magazines in the bathroom instead of beside the recliner. You need to spend time in there anyways, right? Great strategies, JD. Housing, transportation and medical insurance are our biggest expenses, and probably most readers as well. You’ve talked about the first two, but what about health insurance? Are you covered under Kris’ plan? I know for our family a HDHP/HSA works great – our premiums are pretty low and we like the self-insurance aspect of it since we are pretty healthy. Why do you get insurance on your lap top? Well, I don’t automatically do so. I actually have a system worked out. I buy Apple products. I know they’re more expensive, and I know they have their disadvantages. I don’t care. They all have certain advantages, and I’m willing to pay for them. When they work, they just work — no hassles. When it comes to both finances and healthy eating, its “progress, not perfection!” Habits are never easy to change, but it’s also important to find that middle ground (moderation), that seems to elude so many people. We try to practice moderation in both areas, but we slip up sometimes also. I haven’t read all of the 80+ comments, but did anyone mention JD not listening to the radio? No TV I can understand, but no music? Wow. I use line dry my clothes, too, but I have a question – Is all you laundry blue for some reason? C’mon, JD, branch out a little! Just a little kiddin’. I like your blog a lot. >>I know they’re more expensive, and I know they have their disadvantages. I don’t care. They all have certain advantages, and I’m willing to pay for them. That quote is the slippery slope [out of] of frugality. Certainly valid when managed properly, which we can all assume JD does. But dangerous nonetheless. I am not talking specifically about Apple products (which was the subject of JD when he said it) but in general. Depends of course on the situation, both the products in question and the state of one’s finances. I’m currently working on spending too, not so much to control, but to spend without feeling guilty so that I can enjoy the fruit of our work. I don’t know why, although we save and tithe enough, I tend to feel guilty spending. 58 degrees! That would be grounds for divorce in my house! I set it at like 65 and go to work and my wife says I’m trying to freeze them out. At night it’s around that as well. I think 58 would be too low, especially with young kids. But kudos if you guys can handle it, you’re surely saving a bundle! I think these are great tips, but I do think I’d freeze at 58. We keep our thermostat between 65 – 68 in the cold months. We try to purchase just what we need or trade with others not only to save money, but space and time caring for unnecessary items as well. I definitely think that minimizing your exposure to ads leads to less spending. And, being aware of what you spend your money on is insurance that you won’t spend on things that aren’t important. It has worked for us without tracking every day which drives me crazy. J.D.–In addition to buying used items on craigslist, you can find used CDs, DVDs, video games and books and even trade in your used copies of these items at the company I work for, AbundaTrade.com. We use “smart consumerism” to help people buy things at cheaper prices while keeping unwanted items out of the landfills. I hope you check it out. Happy Earth Day and thank you for your fun to read blogs. This IS the absolute most important aspect of your current spending habits. Once I cut off my cable, I’ve been so much more productive and successful. This is also the case for the over 1000 minorities I’ve helped become debt free in 2010. Its the environment that has a 100% direct impact on you generating wealth. Not sure if someone has already mentioned this, but it might help. Our public library has a subscription to The Economist. But if you don’t want to hang out in the library just to check out a magazine, they also have “online resources”, which allow you to view the library magazine subscriptions ONLINE, for free, in pdf form. You should check with your area library to see if they have something like this, it is awesome. Depending on your library system, the type of free things they offer can range from how-to programs by experts (hello, master gardeners), free online language learning software, (Not rosetta stone, but still good), and other helpful things. All PREPAID for by your tax dollars. Nice tips. I love the smell of sun dried clothes. And as others have pointed out, if you have the Economist on twitter, FB or RSS you can practically read the whole thing for free. Great read. So many ways to save and loser money.